Is your child an avid Superman lover, who is looking for free kids Superman games? Fortunately, there are plenty of free games online to delight any aspiring superhero. These Superman games for kids offer a variety of fun options for comic book fans. The internet has given rise to a lot of free activities for kids, including games featuring one of the most famous comic book superheroes of all time and his friends. While there are countless games to play online, this list provides a good starting point for free kids Superman games, so your child can get underway with his playtime and start saving the world. In Superman Metropolis Defender, the Daily Planet where Clark Kent works, has gotten news that meteors are going to hit the city of Metropolis! Clark Kent must transform into his superhero form, Superman, and smash the meteors before they hit the city. Every time he misses, and it hits the ground, the danger level increases. If the danger bar gets too high, the city is destroyed! Yet, be careful as you destroy the meteors-some are made of Kryptonite, and thus you cannot touch them. Want more action-packed free Superman games online? Try playing Superman Returns Save Metropolis. As Superman, you need to protect your city from falling building wreckage. Catching the wreckage is not the last of your duties, however. You then have to carry the wreckage upwards and dispose of it in a safe place. If you don't move quickly enough, Superman falls under the weight of the building pieces! You can also smash the debris with your strength. However, watch out for Kryptonite as you work. Good luck saving Metropolis! GamesHer offers Lego Superman for those younger players. Using your arrows and space bar, you'll help Superman fly through the air taking out missiles and avoiding dangers. Just be careful of letting them hit you because you will fall out of the sky. This game lets you choose to start at with either level 1, 2 or 3. Each game has a different bad guy for you to defeat. In this game, you can not only choose Superman but Batman as well. Have them race against one another on their motorcycles. Fun for all ages, you pick up coins and earn points as you race. In order to move on, you have to win. Take your main man Superman through a variety of different stories through DC Story Maker. You can either create your Superman story from the ground up or you can use different story starters. After you choose Superman, choose a template and start creating. In addition to Superman, you can add other different characters and villains to your storyline. On the Superman Escape app available through GooglePlay, you will help Superman fight asteroids and alien ships. Designed for everyone, you'll use Superman to escape the spaceships or fighting them. In the game, you can use two different modes: survival and escape mode. Those that are hip on 3D graphics might be a bit bored with the 2D arcade-style game, but those that love old school gaming will enjoy Superman Escape. 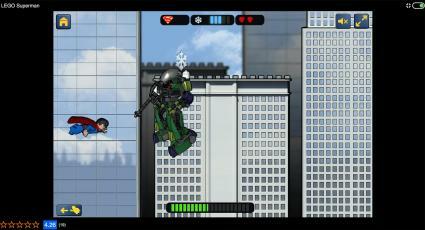 Created by Black Cell Studio, Superboy Aliens War allows you to fight aliens that are destroying your city. Here you will take Superman (Superboy) and fight the aliens using your superpowers like laser eyes. As you complete the different missions given to you by the Department of Homeland Security, you'll level up. Since the app is downloaded, you don't need WIFI to play. In addition to Superman, you can take Hulk, Wolverine and Batman downhill racing and even parachute jumping. The racing app offers over 10 courses for you to ride your motorbike. With different outfits and realistic bike physics, you can race and high jump. You can even do a long jump onto a big boat. These timed races require you to hit checkpoints that you choose by specific times. You can also collect balls and coins to up your score. With so many free kids Superman games to play, there is a fun choice for children of every age group. What better way to spend a day than saving the world and playing with a beloved superhero friend? Kids can play one of these online games for free and have fun with their favorite comic book friend.